Commonwealth Architects and S.B. 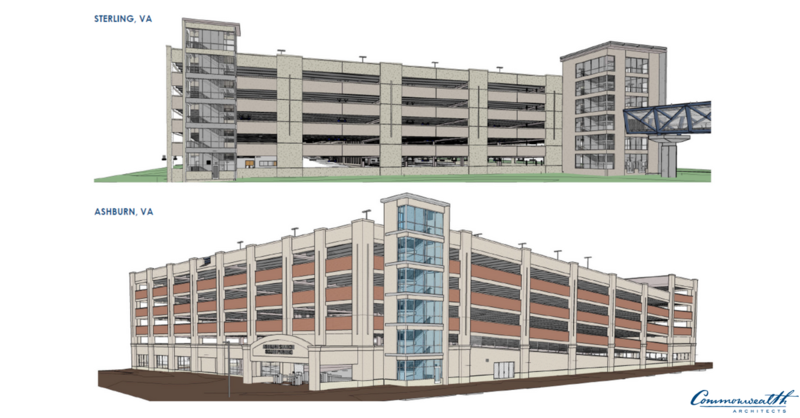 Ballard Construction Company have collaborated on a design-build project involving the design and construction of two six-level consist of intermodal parking structures that will provide a total of 3,500 parking spaces. The parking deck at Loudoun Gateway Station, the larger of the two, utilizes precast concrete double tees with spandrel panels and includes a 175’-0” long steel-trussed pedestrian bridge that provides a connection directly into the Metrorail Station. The second parking deck, located at Ashburn Station South, is being developed in conjunction with the Moorefield Station development. This deck also utilizes precast concrete double tees with spandrel panels with brick to fit into the neighborhood. The two decks have been designed to Parksmart certification standards. Parksmart is the world’s only certification system designed to advance sustainable mobility through smarter parking structure design and operation. Parksmart complements LEED and other certifications and is administered by Green Business Certification, Inc (GBCI). Both garages will include full electronic parking guidance systems (red light/green light sensors) and several electric vehicle charging stations. Both intermodal parking structures will provide commuters with direct access to the new Silver Line Metrorail Stations, providing additional transportation opportunities throughout Loudoun County and the Dulles corridor into Washington, D.C. and its surrounding areas. Construction of both decks is expected to be complete by May 30, 2019.